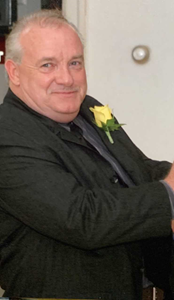 ALBANY- William F. Bacon Sr., 71, passed away on Wednesday, February 6, 2019, surrounded by his immediate family. Bill was born in Albany, NY on July 5, 1947 to the late James and Margaret Bacon Sr. Bill will be remembered as the life of the party, and always someone who wanted to have fun. He loved car racing, and his Irish heritage. His passions in life were music, singing, and being a grandfather. He had a heart of gold. He would do anything for anyone. He is predeceased by his wife, Laurie Bink. He is survived by children, William Bacon Jr., and Joseph (April) Bacon, his grandchildren, Isaiah, Giavanna, Lillian, Benjamin, and Timothy “TJ”, his siblings, Linda Baldwin, and Arthur (Jane) Branigan, and his nieces and nephews, Kalonie Baldwin, Arthur Branigan, and Jennifer Branigan. A celebration of life will be held privately at the convenience of the family. The family would like to thank those all at 4 McAuley Unit, at St. Peter’s Hospital, for all their care and compassion. Add your memories to the guest book of William Bacon. I am so sorry for your loss. Billy always talked about the Thanksgiving dinner we had at my parents house and everyone was invited. Rest in peace Bill and I'll see you in heaven. I'm sure my mother has your ear. My sincere condolences on the loss of your father, father-in-law and grandfather. It is never easy to lose a parent, and your dad sounds like he will be a hard act to follow. I hope he is at peace now and that your memories of him sustain you during this difficult time. Thinking of you all. You and your family are in our thoughts. Our condolences on the loss of your father. Sorry for your loss. The heart of gold thing has definitely been passed on. His legacy will live on.